I really don’t have that many, but I’m almost 50 (3 months till lift off) and my pre-menopausal skin is having it’s last hurrah with breakouts. Like in places I normally don’t get “blemishes” the sweet Southern term for zits. So at my last facial, the therapist recommended a product that I think is helping clear up my skin. 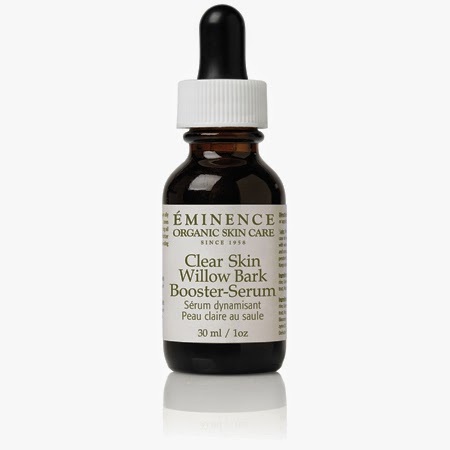 I’ve blogged before on the Eminence Skincare products I use. They are organic and full of good for you ingredients. I am using the Clear Skin Willow Bark Booster-Serum. It’s a brown syrup-like serum you put all over your clean skin before moisturizer. It has willow bark, tea tree oil, walnut leaf, anise, and vitamins A, C and E and Coenzyme Q10. The first few times I used it my skin tingled, now my skin just drinks it up. I was having problems with breakouts along the hair line, under my bangs and along the chin. This serum has cleared all those areas up. The therapist made sure to tell me to use the product everyday as a preventive measure. I purchase my products at the Spa and through my dermatologist. Your face is the first place people see, don’t you want to make sure to take good care of it?